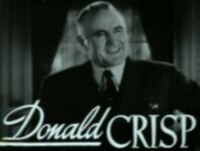 Donald Crisp was an British-born, English and American film actor. He was also an early producer, director and screenwriter of films. He won an Academy Award for Best Supporting Actor in 1942 for his performance in How Green Was My Valley.